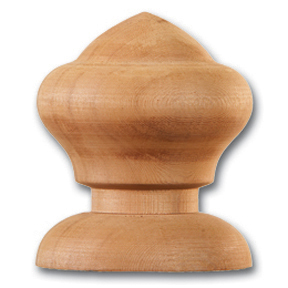 Nantucket Acorn Finial Post Top - Material: Western Red Cedar. Post sizes from: 4" - 6" (Select Above). Finial includes 3" Lag Screw. Item ships within 48hrs or less via UPS Ground Service. 4" POST SIZE: Total Height: 4" Base Diameter: 3 1/8" Widest Point: 3 1/8"
5" POST SIZE: Total Height: 5 1/8" Base Diameter: 4 1/4" Widest Point: 4 1/4"
6" POST SIZE: Total Height: 6 1/8" Base Diameter: 5 1/4" Widest Point: 5 1/4"